Just wanted to share my newest painting- the largest to date – 30 x 24 inches. 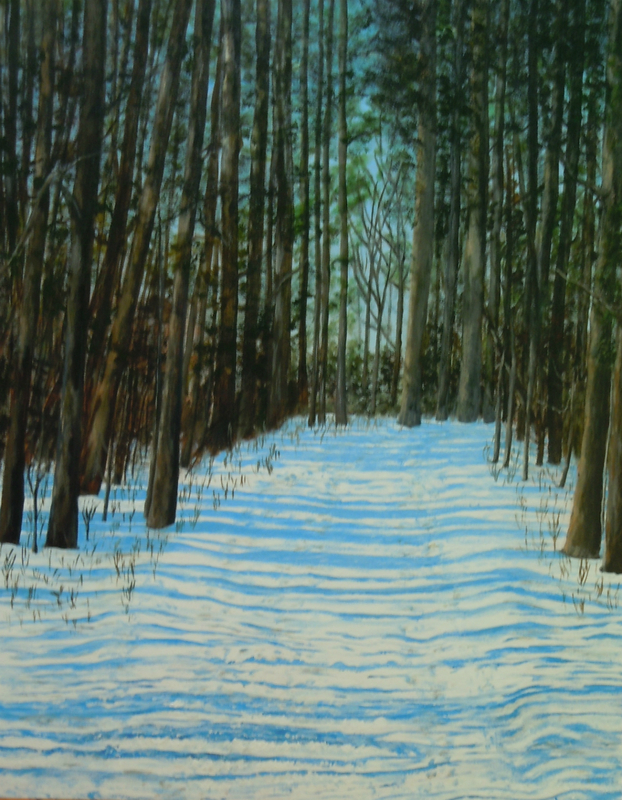 The winter hikes I enjoyed while living in Hamilton inspired this painting. The image is my impression of a section of the Red Hill Valley Trail. We dealt with steep, frozen slopes that we managed to slide down amidst our laughter and screams. I do miss those times and dedicate this painting to my walking friends back in Hamilton! The painting will travel to White Water Gallery in North Bay in January for the Black Water Art Show. So lovely. I live 5 minutes from the Red Hill Valley trail, so it’s nice to see that area depicted for its beauty and not for the speeding cars that zip past it all the time. And love the little snowflakes on the screen. Great work, as always, Wendie. Nice painting. Those were good memories.